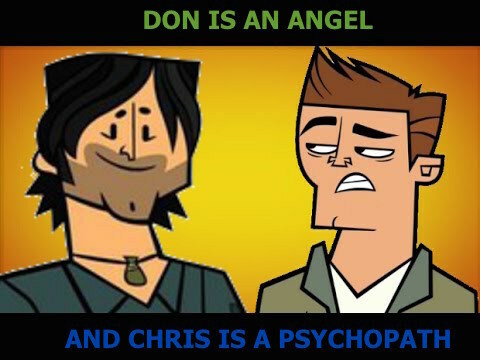 Don is a nice host, and one of the nicest guys on the show, but I can't fathom why he gets the hate from most 팬 of "Total Drama". Even after Chris has done awful things on the show. For me, Chris McLean is the Horrible Person, Because He is being sadistic and cruel to the Contestants, But Don on the other hand, He is very Reasonable, Rational, Wise, Mature and Fair Host, Because He loves the Contestants to play fair in his reality show, But He hates cheaters (Aka The Ice Dancers). So, I prefer Don. Don is the worst. And Chris is Nice. People think he has replaced him, even though RR is an entirely different show from TD, they just take place in the same universe. I don't get it either Chris is a sociopath who enjoys hurting contestants. Don on the other hand tries to get along with most of the contestants on Ridonculous Race and with some of them that isn't easy. I honest preferred Chris. After all, he is funny. I don't exactly hate Don. It's just that I like Chris so much better than him. That's all what I would said.